Reproductive effort is an important parameter contributing to reproductive success, and mortality, in many animal taxa. During their mating season, reindeer (Rangifer tarandus) form mating groups, typically consisting of one dominant male, a harem of females, and a few subordinate males. Within these mating groups, male reproductive effort consists of intrasexual behaviours, such as fighting, chasing, and displacing other males, and intersexual behaviours, such as herding, and attempting copulations. As the number of females in a mating group increases, it is expected that the dominant male will perform reproductive activities increasingly frequently, until a threshold number of females is reached, beyond which males do not need to exert large amounts of effort in order to attain copulations. Meanwhile, it is expected that aggressive activities will peak at intermediate competitor-to-female ratios, since when there are many competitors compared to resources, the cost of aggression is not worth the potential gain, and when there are many resources and few competitors, there is little need for competition. We are using an 11-year data set collected from a herd of semi-domesticated reindeer in northern Finland to examine these issues. We will measure both weight loss of males during the mating season, and frequencies of male behaviours during the mating season, and relate both of these measure to mating group size. We will be studying a reindeer population from the Kutuharju Field Reindeer Research Station in Kaamanen, Finland (69°N, 27°E). This herd is composed of semi-domestic reindeer that are free ranging for most of the year excluding the calving and rutting periods. 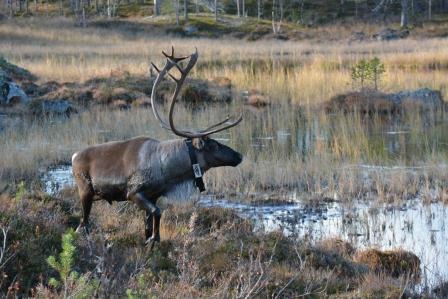 These animals are managed and harvested by the Finnish Reindeer Herders Association, therefore, we are able to continuously gather information on the ecology and behaviour of the individual reindeer. See pictures. Group size affects reproductive effort of dominant males measured as change in mass (both absolute and relative to mass at the beginning of the rut). Group size affects reproductive effort measured by patterns of activity budgets of dominant males during pre-, peak- and post-rut. Group size affects reproductive success measured as the number of offspring produced in a breeding season by a given (dominant) male. E. M. Tennenhouse, R.B. 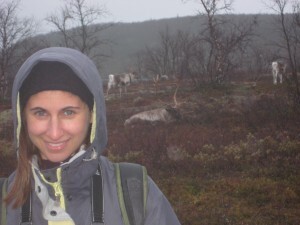 Weladji, Ø. Holand & M. Nieminen (2012) Timing of reproductive effort differs between young and mature male reindeer. Annales Zoologici Fennici 49:152-160. MacDougall-Shackleton E.A., Stewart K.A., Potvin D.A. and Tennenhouse E. 2009. The rich get richer: song complexity predicts song element sharing and song output in song sparrows Melospiza melodia. Animal Behaviour. 78:141-146. MacDougall-Shackleton E.A., Tennenhouse E., Stewart K.A. and Potvin D.A. 2008. Song complexity, song matching and vocal output in song sparrows: If you’ve got it, should you flaunt it or rest on your laurels? 12th International Behavioural Ecology Congress. Ithaca, New York.